A mix of gung-ho action and heavy-handed patriotic pride, the point of South Korean war film Operation Chromite may be somewhat lost in translation for western audiences. And that's despite the presence of go-to hardman Liam Neeson, who chews the scenery – as well as that trademark Popeye-esque pipe – as legendary American general Douglas MacArthur. In this (heavily) fictionalised version of real events, MacArthur has been tasked with directing UN forces to take back the pivotal South Korean city of Incheon, after most of the country was overrun by North Korean troops in 1950. He places a covert team of undercover agents in the North, posing as an inspection unit and tasked with discovering the location of naval mines. 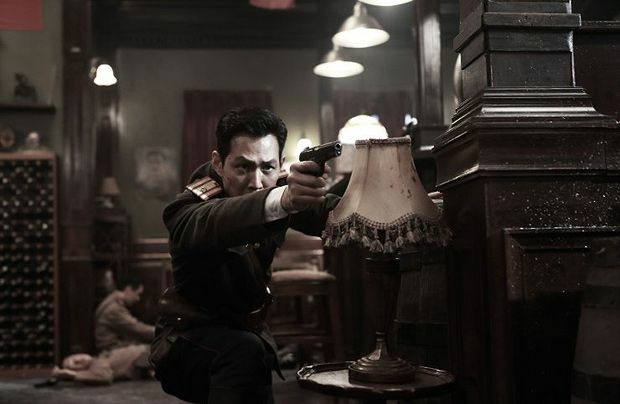 Leading the team is the charismatic Captain Jang Hak-soo (Lee Jung-Jae) who finds himself going up against sadistic Colonel Lim Gye-jin (Lee Beom-soo) – a devoted protégé of North Korean leader Kim Il-sung – in a battle of wits that will determine the fate of his country and the path of history. Director John H Lee, however, avoids the nuances of such military machinations in favour of run-of-the-mill genre bombast: endless gun-slash-knife-slash-fist fights in which it becomes impossible to tell the ill-fated, nameless soldiers from one another. Lee intercuts the action with sepia-toned sequences in which MacArthur runs his unit with a vim and vigour that's so over-pronounced as to become caricature, spouting throwaway lines of dialogue that, like the action, could have been ripped from any Hollywood cliché handbook. Flashback sequences, in which MacArthur recalls why he felt so moved to help save South Korea, pile on the sentiment in spades. It would be satirical, if it wasn't so straight-faced. There's no denying that this is a remarkable moment in history, and one that resonates in the face of current global atrocities. But while Operation Chromite is likely to satisfy its domestic audience, for which it has undoubtedly been made as something of a celebration, its blunt-edged approach may prove too bull-headed further afield. Selected release from Mon 26 Dec.
General Douglas MacArthur (Neeson) places a covert team of South Korean agents in the North. Director Lee conscientiously avoids nuance of any kind in a heavily fictionalised, straight-faced compilation of Hollywood war movie clichés, seemingly aimed squarely at South Korean audiences but unlikely to move anyone else.